We all know that six months is far too long to leave a garment without washing it. We feel guilty at the thought that we could be so filthy. But more and more jeans makers are urging men to wait. Why? Jeans are a reflection of their owner and premature washing can ruin this. Thus, we provide you with a few tips for staying clean whilst keeping them dry (within limits). Everybody is susceptible to the occasional stain – some may enhance the look of the denim, but if that graze is truly ghastly, then spot clean with a damp cloth. Water will suffice; adding detergent will simply wash a single patch of the jeans and result in, for the stain prone, a strange pair of leopard looking jeans. Smells, too, are an obvious adversary. Be it due to showing off barbequing techniques or something altogether more dubious, they are easily eradicated. Any empty freezer space can be used to store the smelly artefact for a few hours – this will hopefully kill any bacteria that have made nest. To make doubly sure, hang them by the belt loops whilst having a steamy shower – any whiff should now be gone. Two tips? We thought this at first, too. But remember that these have been the staple of cowboys and rock gods alike over the years. Denim is meant to be lived in – the more, the better. All the scuffs and scrapes build its character and a personal history. When it does come to washing, do so by hand with cool water and a cap-full of soap. Hang them outside in the sun to dry and put them back on when they’re still a little damp. 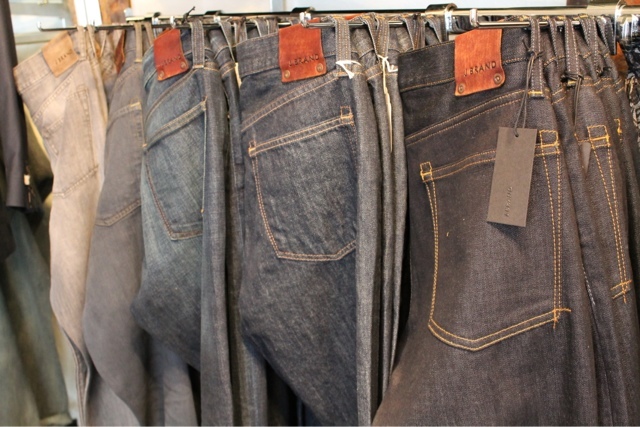 The denim will reshape itself to your legs and the love affair can continue.